Is Swagbucks worth it? Can you really make money? Last updated on March 15, 2019 By Nat 5 Comments This post may contain affiliate links. We appreciate you supporting Rags To Niches! Full disclosure here. Is Swagbucks worth it? Or is the just a waste of your time? Swagbucks has been around since 2005 – and it’s not going to make you rich, it is certainly a lot of fun you CAN quite easily earn rewards. You can save up your Swagbucks for all sorts of gift cards, or straight up cash via PayPal. This is one of the very rare good ones when it comes to survey related sites. 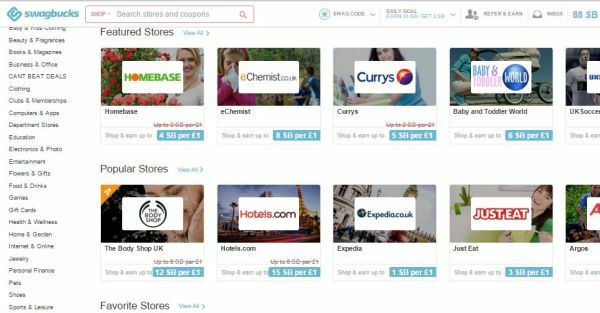 Review In Brief: This is actually one of the few pocket-money sites that I ACTUALLY use! For someone who generally doesn’t recommend that many survey sites, I love this site :). It is effortless to use, has an easy to navigate website and you can earn points just for using their search engine too. I’ve also made plenty using their cashback offers & you can make extra points by referring your friends & family. If you have a blog, YouTube channel, or good social media following – you can make more with their referral program! Sign up for free – $5 bonus via this link! But back then, I didn’t have an interest in particularly saving money online, or doing paid surveys, (I was into entering competitions online back then!). But, after consistently seeing positive reviews of Swagbucks, I decided to return for the purpose of reviewing it. Considering Swagbucks started up over a decade ago, it’s been a long time coming! But I’m pleased that I made the effort to really check it out! Upon arriving back at the site for the first time in years – I found it very easy to navigate and the purpose of the website is perfectly clear. Swagbucks rewards you for various activities with*Swagbucks* – that you save up and exchange for rewards, (such as giftcards or cash!). At its most basic, you can use Swagbucks as you would a search engine, just like yahoo or google. In fact, Swagbucks is now powered by yahoo. The simplest way to make Swagbucks is to use the search engine but other ways include, daily polls, surveys, watching videos and playing games. If you’re using the search engine for your business purposes, you may want to stick to Google, (depending what your business is!). But, for your every day search purposes, the Swagbucks search is certainly just fine! Experiment with it and see how similar it is for your requirements. A swagbuck means a different amount depending where you are in the world – 500SB is $5 paypal for US residents, or for 800SB for £5 paypal in the UK. The amount of swagbucks you need varies depending on the reward you choose to redeem…. By far the simplest way to earn Swagbucks, without going out of your way, is to use the search bar. You can upload a Swagbucks extension to your search bar, (which I highly recommend) and this makes it super easy to use. There is also a fun feature where you’ll randomly earn Swagbucks for searching certain terms. Every now and again during your search, you’ll come across a message like the one above – where you will earn extra points for certain terms. One of the terms I searched for yesterday earned me 39 Swagbucks in one go – so, it really varies. By shopping at certain stores, you can earn Swagbucks by simply accessing the store via their site. I actually love this feature and it’s a really easy way of making a lot of points quickly. Again, this is a simple way of doing it and requires next to no effort, you’re not doing anything extra that you wouldn’t be anyway – aside from an extra click through via Swagbucks! 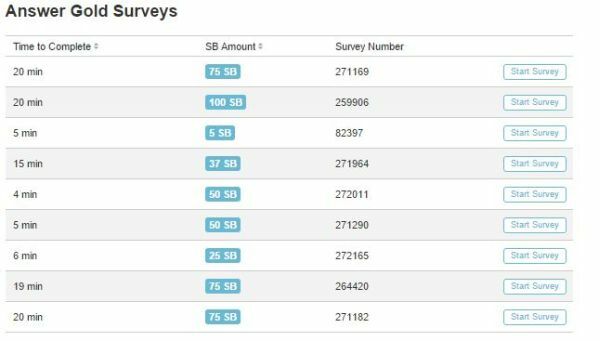 Completing surveys is one way to make a lot of Swagbucks quickly, but it does take extra effort on your part. I personally wouldn’t waste hours of time doing them, as there are better ways to spend your time in order to make money online. That said, if you do the surveys occasionally and choose them wisely, (going for the highest value) it’s one way of boosting your bucks quickly. There are also daily polls, that are very quick and simple to enter. You can also get paid to watch videos. There are videos spanning a wide range of interests and topics – from food, to health, to entertainment. However, you are limited to only being able to make 150 Swagbucks a day from watching videos! You can also earn money playing games, although there isn’t a huge payout here. Nevertheless, if you have a few minutes to spare and feel like playing a quick game, you can build up your bucks. There are a bunch of extra ways to earn to. Two ways which may make you some of the most points are the referral program and the signing up for cash offers. With the referral program, if you get anyone else, (such as friends or family) to sign up – you will get 10% of all their SB for life. So, put another way, when they make 500 SB, you would make 50 SB. While this won’t account to much, it can be an extra perk. Plus, they often have referral bonuses running, where you can make more Swagbucks. Also, if you have a blog or website with an audience, you could promote Swagbucks and get people to sign up that way. If you have a lot of traffic coming to your website, there are more profitable ways you can earn with Swagbucks too – as your blog grows. Another way is by signing up to cash offers. This involves signing up to things like casinos, downloading apps, playing games or signing up to free trials. Many of the offers are not free, (but you either get a discount or are paid more back in Swagbucks than you pay out). There are a small number of free offers that you can sign up to. While you can earn the most by signing up to free offers, I wouldn’t recommend doing a tonne of them, (unless they’re things you genuinely want!). Giving out your personal details/credit card info to unlimited companies can leave you open to major spam, (as well as charges to your card if you aren’t careful cancelling free trials and so on). That said, if you’re careful what you sign up for, it’s an easy way to make a whole bunch of extra points! Join Swagbucks – $5 Bonus! You can exchange your Swagbucks for gift cards – the most popular being Amazon. You can also exchange directly for cash, via Paypal. To put it in perspective, you need around 500 Swagbucks to exchange for a $5 giftcard for Amazon in the USA, (other rewards are available). While 500 Swagbucks may sound like a lot – it really isn’t that difficult to earn, if you’re regularly using the search engine and doing the odd survey, it quickly adds up. You could save up these gift cards to save towards birthday or Christmas presents and could end up with a nice little saving by the end of the year. Since there are multiple ways to earn rewards, you can certainly boost up your earning potential considerably more, if you feel like it! I don’t recommend spending vast amounts of time playing videos and games, (unless you feel like it of course) because the reward for your time is minimal. That being said, you can always watch the videos in another window and do other things while they’re playing. Plus, if you have some spare time and you’d otherwise be doing nothing at all – why not do some of these things. You could easily complete some of these tasks while watching TV, for example. The toolbar extension is pretty awesome. Because you can search online and earn Swagbucks for no effort at all. It’s nothing you wouldn’t already be doing anyway, you just have to remember to use it! You can earn money for doing nothing that you wouldn’t normally do. It’s quite fun winning bonus swagbucks during your searches. You can get extra Swagbucks for things you’d be buying anyway – via their cashback offers or cash offers. You can earn Swagbucks by referring your friends and family. You could get suckered into spending hours on there playing games or doing surveys – which isn’t financially beneficial enough to warrant the time. Some people have complained that they haven’t been credited the correct amount of Swagbucks, (I have never had this issue at all). Conclusion: is Swagbucks worth it? Well, there are two sides to this answer! If you’re looking for a real opportunity to make decent money online and quit your day job then – no – this is not that opportunity and you’re looking in the wrong place. However, all it takes to make some extra cash is to merely use their search engine and perhaps shop online via their links – which takes no effort at all. In this sense, YES it is definitely worth checking out. Really, everyone should sign up for this; as earning points is free and can start by simply using Swagbucks as a search engine. There is a large number of different ways you can earn, whether that be from cash back, cash offers, surveys, games or watching videos – so, there’s sure to be some way you will find you enjoy more. With Swagbucks, you really can earn something for practically nothing, which is certainly a rarity. It’s not often that you can make money with next to zero effort and so from that point of view, it’s definitely decent and it’s a legitimate opportunity to make a few extra dollars. Beyond Survey Sites: Making More Online! Swagbucks aside, if you are looking to make a proper income online, (whether that be a couple of hundred dollars a month, or a full-time income) and aren’t afraid of a bit of work and dedication, there are a variety of ways that you can reach those goals online. In my own case; I make the most online right now from affiliate marketing on my website – which is via recommending products and services online. It’s a great option for beginners, because it’s not expensive or complicated to learn and you don’t have to be technical minded to understand it. Another way I earn money from a website – is by having Ads on it. This is something you can earn from once you get a good amount of traffic and it’s quite amazing, because it’s entirely passive income. You can learn exactly how I make money from a website here. Have you signed up for Swagbucks? Legit companies that have recently paid me. Hmm.. This doesn’t seem so bad. I realize I can’t make a living off this, but do you think it would be fair to say that I can earn an extra few dollars a week? If I find a few of these companies that pay you just to search the web, I could probably make some nice pocket cash. What do you think? You can certainly earn that – it’s not hard with swagbucks because if you can’t be bothered with surveys, (and really… I can’t) then what’s hard about using the search engine? I also use the cashback frequently now. What I recommend is downloading the google chrome icon for it, which takes seconds. Now, whenever I’m on a site that uses swagbucks, swagbucks will pop up and let me know I can redeem swagbucks using that site – which is really helpful. Give it a go — nothing to lose. I read your post titled, “Is Swagbucks Worth It…. ?” I think you done a good job of explaining all the various money making features. I used Swagbucks a couple of times myself because it was recommended to me by another member of WA, but I honestly did not feel it was for me. It just seemed like a nickle and dime program. It sounds like they have grown and improved. I will have to go back when I have some free time. “It’s NOT going to make you rich.” Yep. What you said. I actually just reviewed Swagbucks on my site (self-promotion removed) in case anyone is interested. I found that it IS true that you can make points towards gift cards, but I have to say that I prefer the option to get an actual check-in-the-mail with other sites (like Inboxdollars).